Published: Sept. 29, 2014 at 12:16 p.m. Updated: Oct. 3, 2014 at 11:35 a.m. The pass-centric nature of the NFL makes it imperative for a dominant defense to feature elite pass rushers off the edges. Defensive coordinators constantly stress the importance of being able to disrupt the rhythm of the quarterback in personnel meetings, so general managers frequently instruct their scouts to search for pass rushers with explosive first-step quickness and closing burst when evaluating prospects for the draft. While elite edge rushers also flash power and hand skills, evaluators covet speed, quickness and agility at a premium when breaking down top prospects at the position. Thus, there has been a ton of interest in the NFL scouting community in Clemson DE Vic Beasley after watching him dominate the college ranks with his remarkable speed, quickness and athleticism off the edge. Beasley elected to return to college for the 2014 season to refine his skills as a disruptive playmaker even though he already had recorded 21 career sacks, 31 tackles for loss and 20 quarterback pressures as the designated pass rusher for the Tigers. The Clemson standout has continued to display the dominance expected of a blue-chip prospect off the edges through the first month of this season. The 6-foot-3, 235-pounder has notched six sacks, seven tackles for loss and a quarterback hurry in four games. Most importantly, Beasley has flashed the ability to take over the game with his speed, quickness and burst. He overwhelms offensive tackles with his "get-off" and burst, yet it's his balance and body control that allows him to turn the corner against elite pass protectors. Beasley obliterated Florida State OT Cameron Erving with his explosive athleticism in a Sept. 20 game, and Beasley wore out young North Carolina OT John Ferranto with his speed, agility and burst on Saturday night. Beasley finished the night with two sacks and he completely changed the way the Tar Heels' offensive coaches called the game due to his persistent pressure off the edge. North Carolina was forced to attack the Tigers with quick throws and bubble screens as Clemson's defense was able to dictate the pace of play and impose its will for most of the night. Now, I must point out that Beasley's skills against the run still need work. He gets knocked off the ball by big, physical offensive tackles at the point of attack and his inability to work free from run blocks could be a concern if a team is searching for a "complete" player off the edge. However, I've been around enough defensive minds to know that pass-rush skills are coveted at a premium and Beasley's potential to create disruption on passing downs will push him to the top of the charts in most war rooms. With a few more good games against quality offensive tackles, Beasley can make a strong case to be included in the conversation as top-15 pick when scouts convene at the end of the season. 1. Florida State: The Seminoles haven't played up to expectations based on their loaded roster, but Jimbo Fisher's squad has shown a grit and resiliency that will make them a tough out despite their flaws. 2. Oregon: The Ducks have shown vulnerability on both sides of the ball, but the presence of QB Marcus Mariota has masked their flaws. With a stern test against Arizona on the horizon, we will find out a lot about Mariota and his supporting cast this week. 3. Oklahoma: The Sooners appear to be the most complete team in football, but they haven't faced an elite foe to this point. Although Tennessee and West Virginia posed some problems for the Sooners, Oklahoma's true tests will come when it ventures into Big 12 play, particularly a date with TCU this weekend. 4. Alabama: The emergence of an explosive offense gives the Crimson Tide a different dimension than the college football world is used to seeing from a Nick Saban squad. The connection between QB Blake Sims and WR Amari Cooper could lead Alabama to feature a pass-first attack, but a deadly three-headed monster in the backfield ensures a balanced approach from the Crimson Tide. 1. QB Marcus Mariota, Oregon: The Heisman Trophy front-runner had the weekend off, but he returns to work on Thursday night against Arizona. He needs to pile up big yardage against a Wildcats squad that heads to Eugene full of confidence following last season's surprising upset win over the Ducks. 2. 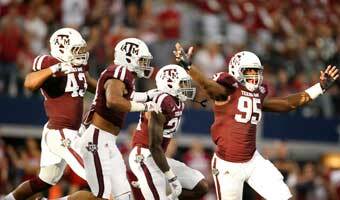 QB Kenny Hill, Texas A&M: "Trill" was a little off his game for most of the Arkansas contest, but he stepped up big in the fourth quarter and overtime to guide the Aggies to a big SEC win. Hill connected on 6 of 10 passes in the fourth quarter and overtime with three touchdowns and one interception. Most importantly, he rallied his team back from a 14-point deficit with 12 minutes remaining in the game by making a number of pinpoint throws that kept the chains moving. Given the importance Heisman voters place on the clutch factor, Hill remains a viable option for the honor. 3. RB Todd Gurley, Georgia: The big-bodied runner continues to rip through the SEC with his punishing running style. Against Tennessee, Gurley rushed for a career-high 208 yards and scored a pair of touchdowns on the way to helping the Bulldogs earn a hard-fought victory over their SEC rival. Although running backs are seemingly devalued in football, special runners still garner significant respect as game-changers with the ball in their hands. Gurley deserves respect as a blue-chip talent. 4. RB Ameer Abdullah, Nebraska: After posting his third 200-yard game of the season, Abdullah deserves a mention as one of the top players in college football. The 5-foot-9, 195-pounder has been spectacular with the ball in his hands, exhibiting outstanding speed, quickness and burst on the perimeter. With Abdullah also showing a penchant for putting the ball in the paint (eight touchdowns), the Nebraska standout is definitely in the mix for college football's top honor. 5. QB Everett Golson, Notre Dame: Despite spending a year away from the game due to an academic suspension, Golson has quickly reemerged as one of the top playmakers in college football. The senior signal-caller wasn't at the top of his game Saturday against Syracuse, yet he completed 26 straight passes on the way to connecting on 32 of 39 passes for 362 yards and four touchdowns. Although his four turnovers (two interceptions and two fumbles) marred the effort, the fact that Golson has been so efficient to this point (15 total touchdowns against four turnovers) puts him in the mix.